Two images come to mind when I think about my current stance on all things about this God I can no longer believe in. 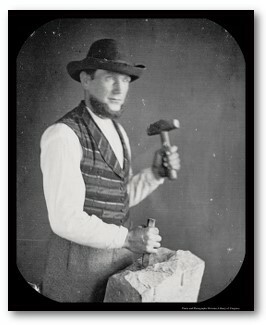 One is an image of a man hammering away at a stone – I think of Jacob Riis's Stonecutter's Credo. I think of a stonecutter hammering away at that stone, waiting and waiting for it to crack, for something to happen, for all blows that seemingly do nothing at all to finally be enough to crack the stone. What we don't know is that in just one more blow with that stonecutting tool, the stone will give way. Maybe that's what our search is like – seemingly, nothing is happening. All is met with silence, the questions don't go away, there is a painful standstill. If or when anything will ever change – this we don't know. The other image that comes to my mind is of a branch growing out of the face of a cliff. William James has made this analogy in his book “The Varieties of Religious Experience” (I have not read the book, just an excerpt from it). A man has fallen off of a cliff and clings onto a branch on his way down. He sweats and worries, desperately holding on as he waits for rescue. Finally, he can't hold on anymore and so... he lets go. To his surprise, the drop isn't so far – just a few centimeters. He'd been so concerned, all for nothing! It really isn't so bad! These images come to mind when I think about where I am now. In one way, the Stonecutter Credo rings so true – maybe, maybe, one more day of searching, maybe one more book to read, maybe one more conversation or one more prayer, and I'll make it through to God, the way it used to be. Maybe there IS a God. Mostly, though, I feel like that man who is clinging on to the tree, about to fall and realize the truth – there is no God, and all the things I grew up believing so wholeheartedly, those songs I could sing along with with such emotion, and those prayers that seemed so powerful...it's no longer like that for me. And it's not so bad after all. Yes, things are very different now. But the world is not so bad. I still feel hopeful. I don't really understand the meaning of life and suffering and all those big questions, but even with God, I still would not understand all of that. Maybe the only answer we can give is, “I don't know.” I think that may be enough.